Greetings, after having attended a few of the wonderful star parties put on by CCAS Iâ€™ve just recently decided to become a member and was given this opportunity to introduce myself. My name is Ryan, or perhaps more commonly known as â€œthat guy over there with the Coronado PST,â€ and I currently live in Templeton. 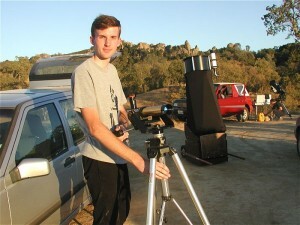 Beyond amateur astronomy Iâ€™m an avid student of philosophy (have nearly completed my BA in philosophy from Cal Poly) and the martial art of Aikido (just in case a wild animal attacks while Iâ€™m hunched over the eyepiece). Like many Iâ€™ve had a lifelong feeling of wonder and awe at the profound beauty of the night sky, but it only occurred to me about four years ago to buy my first telescope. I started my journey then with what at the time seemed to me a massive 10â€ Dobsonian, which much to my parentâ€™s horror lived where else but in the living room. On my first night out I was enthralled by the incredible beauty of the stars I could see through it, and marveled at what I thought to be only a regular cloud in the sky blocking my view of four little stars in Orion. Oddly enough all these years later that â€œcloudâ€ is still there, but fortunately so is my great love for the majesty of the universe. In that time my telescope collection has expanded, the most recent addition being my home made 16â€ truss Dobsonian telescope built around a Meade primary mirror, which had its first public appearance at Septemberâ€™s star party. The planning and building process ended up taking me about a yearâ€™s worth of sporadic work to complete. It was one of those projects that seem easy on paper, but not quite so easy in practice as I labored during hot summer days trying to make square cuts and racing to align parts as glue dried. During its construction I had often wondered if it was really all worth it, but that wondering came to an abrupt end last winter with the telescopeâ€™s first light. Appropriately enough the first deep sky object I pointed the telescope to was the first I had ever observed, that same little persistent cloud more commonly known as the Great Orion Nebula. It was one of those observing experiences you will never forget, made all the better knowing that I was seeing it through a telescope built by my own hands. Despite having bought and sold many telescopes over the few years Iâ€™ve been in this hobby (a bit of an equipment addict), I know the 16â€ will be one that I will keep for a lifetime. My passion for astronomy has only continued to grow and Iâ€™ve recently begun to explore solar H-alpha viewing with my PST, as well as getting into astrophotography. Anyway, so there is a little about myself and my telescopes, I look forward to meeting and sharing the night sky (oh, and even day sky with the solar scope!) with the rest of you in the future.